Jamie Mott is a New York licensed physical therapist at Professional Physical Therapy. After graduating from New York Institute of Technology with a bachelor’s in Life Sciences, Jamie went on to receive her doctorate in Physical Therapy at New York Institute of Technology. Jamie has been practicing for 2 years and specializes in Sports Rehabilitation, Orthopedics and Pediatrics. Jamie has certifications in USA Weightlifting Association Sports Performance Coach and Impact Trained Physical Therapist and is also a member of the APTA. Michele Aliani is a New York licensed physical therapist at Professional Physical Therapy. Michele received her bachelor’s in Physical Therapy at Quinnipiac College. Michele is also a member of the APTA, NATA and the NSCA. Robert Berghorn Jr. is a New York licensed physical therapist at Professional Physical Therapy. After graduating from Sacred Heart University with a bachelor’s in Athletic Training, Robert went on to receive his doctorate in Physical Therapy at Stony Brook University. Robert specializes in Muscle Energy Techniques, Functional movement, Biomechanics and Grastson. Robert has certifications in Graston and is also a member of the USAW, NATA and APTA. Anna Chow is a New York licensed physical therapist at Professional Physical Therapy. After graduating from New York University with a bachelor’s in Physical Therapy, Anna went on to receive her master’s in Biomechanics and Ergonomics at New York University. Anna also did a Hand Fellowship at Texas Woman’s University. Anna has been practicing for 27 years and specializes in upper extremity. Anna is also a member of the American Physical Therapy Association and American Society of Hand Therapy. Mike (Michele) Aquino is a New York licensed physical therapist at Professional Physical Therapy. After graduating from Adelphi University with a bachelor’s in Exercise Science and a master's in Exercise Physiology, Mike went on to receive his doctorate in Physical Therapy at Stony Brook University. Mike has been practicing for 2 years and specializes in Sports Rehabilitation, lumbar spine, cervical spine, foot and ankle. 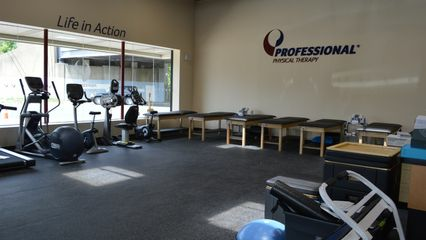 Mike has certifications in SFMA-I and is also a member of the APTA and ACSM.